of municipal services and programs. The Ontario Works Program provides income and employment assistance for people who are in temporary financial need. willing to participate in employment assistance activities. The amount of money that someone receives from Ontario Works varies depending upon housing costs and family size. Clients may also be eligible for drug and dental coverage, eyeglasses, hearing aids, and community and employment start-up benefits. All recipients of Ontario Works are required to participate in one or more employment assistance activities as a condition of eligibility for financial assistance. This helps people move as quickly as possible to a job and to become self-reliant. 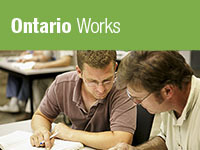 Ontario Works provides practical help in finding a job. It helps people determine what they need to become employed. Because different people have different needs, Ontario Works has a number of ways to help its clients. Some participants need to update or upgrade their skills. Some need to complete their basic education or training for a particular job. Others simply need help in finding a job and staying employed. Ontario Works addresses these needs through a range of employment assistance activities based on individual skills, experience and circumstances. Website Development: PG Advertising and Design - Sudbury.